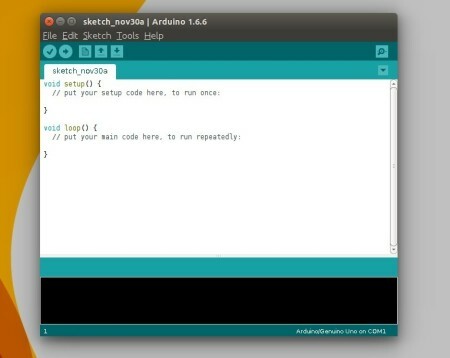 Quick tutorial shows you how to the latest Arduino IDE, so far its version 1.6.6, in all current Ubuntu releases. The open-source Arduino IDE has reached the 1.6.6 release recently with lots of changes. The new release has switched to Java 8, which is now both bundled and needed for compiling the IDE. See the RELEASE NOTE for details. Don’t know your OS type? Go and check out System Settings -> Details -> Overview. Finally, launch Arduino IDE from Unity Dash, Application Launcher, or via Desktop shorcut. Installed Arduino IDE icons on menu and desktop ! Just edit the script by hand, search for the line creating the icon in the desktop and change the folder name. Thank you. You have provided a real help in getting me an up-to-date Arduino IDE on Ubuntu 15.10. I just need to work out how to make it talk to my new Yun……. Thanks. Had been struggling with this for ages until I read your guide. Works with latest 1.6.8 as well, just substitute the relevant digits in the commands. Just need to get an Atmel Studio style IDE in place for the full functionality I’m seking to be able to ditch Windows. It worked fine in Linux Mint 17.3 64 bit and latest Arduino IDE 1.6.9. Also the install.sh script worked fine although I don’t have the OS in English. Thanks for this post. It got me (noob) from zero to almost there. I’m trying to use the Arduino IDE. I have a Borrowed Acer running Linux 32 bit. I went through the extraction process (Thank You!) and got the icon to appear on the Ubunto 14.04LTS I’m running on an old Acer. I can get the IDE to start, but then it goes back to being an icon. So then I reboot. Each time I reboot, the Aeduino icon is gone from the launcher, so I’m guessing it’s not configured properly. If you have any ideas, please let me know. Meanwhile I’ll keep whacking away. I tried to manually access the file and when I try to open the “xdg-desktop-menu-dummy-menu” file, it says that this file is locked and I do not have access. Please help me to resolve this issue as I use the Arduino IDE a lot, and would like to be able to use it on my linux laptop also. HI, I also had the same problem. Navigate to the icon at the place where you have your icon and then change the permissions of the created shortcut.
) and as a result, I’m also not able to compile and run sketches to my board. Please help me out. After running “chmod +x install.sh” I also ran “chmod -R 777 *” to give permissions for the script install.sh. Yes, I know. It’s bad to give general permissions like that. But it solves stuff and it wasn’t a critical application. You don’t need to change any permissions. Just make sure you don’t (that is DO NOT) run the install script as root or “sudo”, that will make “root” the owner. Just follow the directions and run the install script, it will fuss about the permissions just hit “y” and enter and move on with your life. If you get a desktop icon with a little lock, you have installed with elevated privileges. If you see the Arduino icon, you have installed it properly. CARRY ON MAKERS! works for ubuntu 16.04 , arduino 1.6.9. thanks …. what do I need to do to get chmod working? you should now have a sketch icon on your desktop. Installing Arduino IDE on Ubuntu16.04 TLS was no problem. Even when I connected my Elektor Uno R4 and went to Tools>Boards> the list of AVR based boards showed up and my clone, that uses the controller with a “B” added to the controller name, was recognized as an Arduino Uno. When testing with the Example “Blink” it compiled but failed to load the program as he then found out the controller was unknown to him! Opening File>Preferences> the board manager did not show in the window. Same when looking at Tools>Board> also no Board Manager option was visible. I need to add my clone for which I do have a URL from the provider “Elektor”, but it seems in Linux versions there is no Board Manager! What can i do to start playing with my board? Hie ,, i’m facing same problem..unable to find board manager and URL box under preferences…did u find the solution how to include packages for external boards?…i’m trying to include NodeMCU-esp8266 board for arduino.. and i’m using Debian….Please help me out!! how to install board packages for external boards(non -arduino)…. Hey works, I had to make a few adjustments as i am using 1.6.11. All in all it is up and running and icon on desktop launches the sketch ide. Have a great day and thanks for the info. Work good on Ubuntu 16.04.1 and Arduino 1.6.12. They are both 64bit. Any idea’s as to what the problem may be? Are you sure that you installed the correct version for your system? That’s the sort of message you get if you try to run a 64-bit executable on a 32-bit system, for example. to find out what sort of file it is. Compare that against the result of ‘file’ on something that runs OK (e.g. /bin/ls). if i can make .sh file how? With 1.6.13, you don’t need the chmod on install.sh; it has now sensibly been packaged with execute permission already on. Just installed v. 1.8.0 following instructions on 32bit UBUNTU 14.04. Works like a dream. Thanks!